Don’t let student loans stand in the way of your tomorrow. See how much you can save by refinancing. With student loan debt escalating each year, many Americans are more focused on making a living than living their lives. First Tech is here to help. Our Student Loan Refinance Program may help you manage student debt by improving cash flow, so you can live the life you want now. Think of it as your fast track to prosperity. Plus, when you refinance your private or federal loans with a member-owned credit union, you also get piece of mind that money made from your interest goes back into the products and services that benefit you. When you refinance your student loans with First Tech, you’ll work with a dedicated specialist to assist in finding a loan and repayment schedule that grows with your success. We listen to your needs and goals and offer the products and services to help you achieve them. Pay the same fixed monthly payment throughout the loan term. This option will accrue the least amount of finance charges over the life of the loan. Pay lower monthly payments at the onset with one final large payment. A great benefit for professionals who may have bonuses or higher earnings potential as their careers grow. Smaller initial monthly payments. A great benefit for professionals who are likely to have bonuses or higher earnings potential as their careers grow. Refinancing your student loan is just the start. At First Tech we're here to help you with your entire financial life; and that's why, once you get your new student loan, you may also be eligible for discounts on Auto Loans and bonuses on Checking Accounts and Credit Cards. 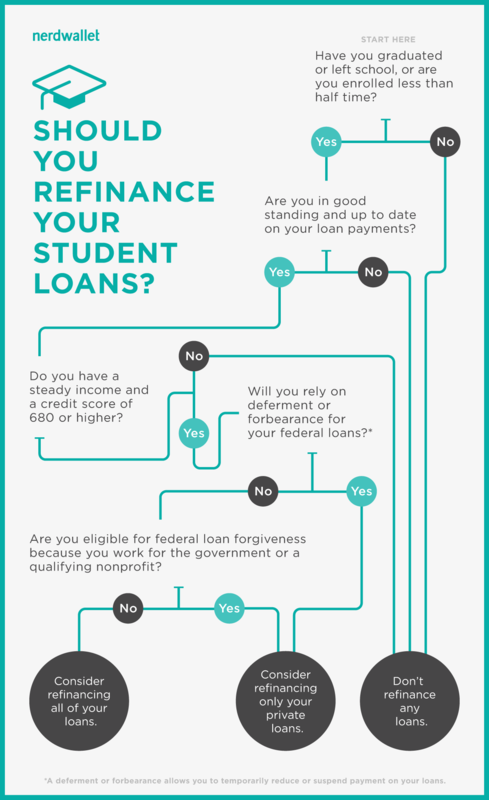 Is refinancing your student loans the right thing to do? Our DebtSafe program offers the ability to cancel all or a portion of the loan balance in the event of Loss of Life, Disability, or Involuntary Unemployment. Banks are for-profit and credit unions are owned by the members and are not-for-profit. Joining First Tech is easy. Are there branches near me? First Tech has over 40 branches with hubs in Washington, Oregon, & California. You can deposit or withdraw money from our network of over 30,000 co-op branches and ATMs. Best of all, First Tech has one of the most advanced banking apps in the industry that allows you to deposit money, pay bills, transfer money, and send money to friends. What are the benefits to refinancing my student loans? A lower interest rate and/or a smaller amount of money paid out over the life of the loan. What are possible disadvantages of refinancing my federal student loans? Federal loans offer specific protections for some borrowers including loan forgiveness, deferment, and forbearance. These options could be lost by refinancing a federal loan to a private loan. Rates are determined by your credit score, terms of the loan and the amount of the loan. The rate will be disclosed to you prior to you accepting the loan. Will I save money by refinancing my student loans? The potential to save money when refinancing depends on a few factors. Both the rate and the length of the new loan will impact your monthly payments. It’s possible to save money on a monthly basis but still pay more over the life of the loan. It’s important to look at all factors when looking to refinance a loan. What documentation will you need from me? During the application process we’ll need proof of income, usually a W-2 form for the last two years and a current paystub will suffice. Additionally, we’ll need the most recent statements of your current loans. Other items may be required as we process your loan. You may email the Student Loan Team any time at studentloans@firsttechfed.com or call 888.422.5680. Can I refinance a federal student loan at a lower rate? If interest rates have dropped since your original loan disbursement, you can take advantage of the lower rate by refinancing. Securing a better rate not only lowers your monthly payment, but reduces the amount you owe over the life of the loan. Can I refinance a student loan if I have already refinanced my student loan with another financial institution? Yes, you may refinance student loans at First Tech even if you have already refinanced with another financial institution. Is there a minimum or maximum student loan amount I can refinance? You may refinance student loans in a range of sizes, small or large. The First Tech student loan team can review your current student loans and make a recommendation based on your individual account . Do I have to refinance all my student loans together? You may refinance select student loans with First Tech, but each individual loan must be paid in full. You may not refinance with a partial payoff on a student loan. Can I refinance private student loans? You may refinance all student loans, consolidating private and federal loans together. Can I refinance a Federal Direct Loan? Yes, you may refinance Federal Direct student loans with First Tech. Can I refinance federal student loans that are held by a third party service like Mohela or Nelnet? Yes, you may refinance federal student loans with First Tech, even if they are held by a third party service. Can I refinance a PLUS loan? You may refinance a PLUS student loan if you are the primary signer on the loan. What does refinancing look like? Which student loan refinancing option is best for me? There are many student loan refinancing options. The type of loan you choose depends on the timeframe (how long you want to take to repay the loan) and what size payments you are able to make. If you want to make lower payments now, but anticipate you will be able to make higher payments in a few years, you may want to look at a Balloon Loan or Interest-Only Loan. If you are looking for a lower interest rate and consistent payments for the life of the loan, First Tech’s popular Fixed Term Loan may be right for you. Contact a First Tech student loan expert to discuss your student loan refinancing options. Which refinancing interest rate will I get? Student loan interest rates are determined by your credit score, terms of the loan, and the amount of the loan. How do I refinance my student loans? What documentation will you need to start the refinancing application? How long does it take to refinance my student loan? The application process to refinance student loans typically takes about five (5) business days. Some unique situations may take longer to process. How soon will I have to start repaying my refinanced student loan? Repayment on your student loans depends on the type of loan. For Fixed Rate Loans, your first payment can be up to 90 days after closing. For Balloon and Interest Only Loans, your first payment is due 30 days after closing. Can my parents co-sign on a refinanced student loan? A refinanced student loan can be co-signed by a parent as long as the primary signer on the original loan is the same before and after refinancing. Can I defer my payments if I go back to school? At this time, First Tech does not offer this option. Who may I contact with questions? Please contact a First Tech Student Loan specialist. What does First Tech offer? Can I get a new student loan from First Tech Federal Credit Union? First Tech only offers refinancing of current student loans. Is there a difference between loan refinancing and loan consolidation? Loan refinancing can be a great way to save money. When you refinance student loans, your old loan(s) are paid off with a new loan, and the old terms are replaced with new terms. Most people choose to refinance their student loans to pay less interest or have smaller monthly payments. Loan consolidation combines multiple student loans into a single, larger loan. You may consolidate private and federal loans together, so you make just make one payment. What is the Student Loan Lifestyle Package? The Student Loan Lifestyle Package is available exclusively to First Tech members. Student loan refinancing is just one of the many great benefits available when you become a member. The Student Loan Lifestyle Package includes special bonuses and discounts on other First Tech products like checking accounts and credit cards. Ask the Student Loan Team for more information. *APR=Annual Percentage Rate. Actual rate will be determined based on the applicant's credit history, and final loan terms. Offer is subject to normal credit qualifications, meeting First Tech Federal Credit Union's relationship requirements and underwriting policy guidelines. Interest rate and program terms are subject to change without notice. Additional restrictions may apply. **15-Year Fixed Loan Term Rate selected for comparison purposes only, your current rate may be higher or lower. a. Not all existing student loans will qualify for refinance under our program; eligibility depends on the school of graduation and the degree .The school must be Title IV eligible, non-profit and offer Bachelors, Masters and/or Doctorate degrees. Title IV refers to the Higher Education Act. A Title IV school is an institution that processes U.S. federal student aid. b. Membership with the Credit Union is required to obtain a loan. c. A balloon loan is a loan that requires a larger-than-usual one-time payment at the end of the loan term. This can mean your payments are lower in the years before the balloon payment comes due but you will owe a larger amount at the end of the loan. d. An interest only loan will have lower payments during the interest only term and will result in a higher payment during the payback period when principal and interest is included in the monthly payment. e. Choosing the balloon loan or interest only loan will result in additional interest over the life of the loan when compared to the fixed loan.